nokia will never make android phones but see they are still number 1 . where is that samsung vision that they will overtake Nokia? haha. in their dreams. 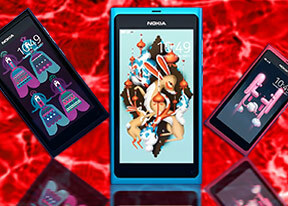 nokia is commited to two os only symbian and meego. My real problem is going to be what phone to buy.. the N8 or the N9!!!! i'd prefer symbian than meego. use symbian^3!!!!!!!! Anonymous, 19 Jun 2010i wish this phone could be slim than the iphone and maybe a super amoled screen and android os... morei heard that Nokia has a commitment that they will not use android OS instate of using Symbian OS. maybe it because that Symbian have been bought by Nokia. CUL..I wish it releases soon..
No need to launch it. What is the next bomb of nokia? I hope this phone has 3x optical zoom. I would like to clarify that nokia n900 is "NOT" a communicator phone..yup it has the features and facility..but nokia has not announced it as a communicator..people are morons if they think that n900 is a communicator.. wtf!!!!!!!!!!! v3.0 bluetooth?! crazy la! must buy!!!!!! and has all the ultimate feature of n8. Wait a second, im having a really hard time figuring out how the hell is that dog and van damn get the hell outta there guys? I dont know with you if you have any ideas... But damn!!.. hoping for 512 MB RAM n A8 cortex CPU and 4.3 inch amoled screen with higher resolution than N8, same resolution as N900 maybe for great web-browsing.